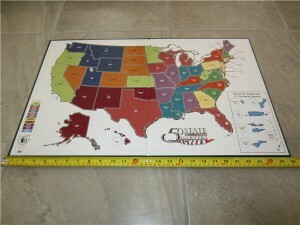 Quarter maps are one of the more popular products out there. They usually attract “just getting started” coin collectors and/or those that noticed different type of quarters in circulation and thought that it would be “cool” to collect all. Whatever the case is…. 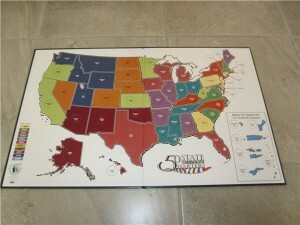 if you are collecting US quarters, you probably want to buy a quarter map to organize your collection. This review is going be about Littleton US Quarter Map. The map usually retails between $12.95 and $19.95. It arrives folded in half in a plastic wrapper. 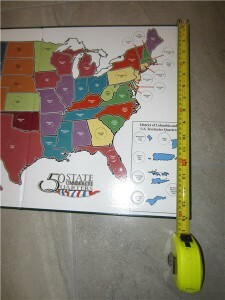 The map is approximately 26 inches wide and 16 inches tall. It is made of carton with a thin paper map glued on top of it. All quarter holes come pre-cut so all you need to do is remove the carton placeholder and insert a real quarter. Once inserted, quarters appear to be sitting in their appropriate places very tight. We tried shaking the map a few times and no coins fell out (Note: I’m sure that if you shake the map too hard, eventually the quarters will fall out). When we wanted to take a quarter out, we actually had to use a small pocket knife. 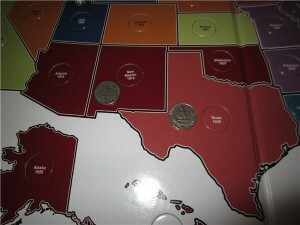 States that are too small to fit a quarter show an arrow from either right or left margin to the corresponding state.